Dürfen wir vorstellen: Die momentan am härtesten in Sachen glitzerndem, unmissverständlichem Indie-Pop mit Eighties-Wurzeln arbeitende UK-Band. Unterwegs in den schlüpfrig-glatten Fussstapfen von Phoenix, Haim oder auch Two Door Cinema Club, sind Fickle Friends die ultimative neue Pop-Speerspitze aus dem Königreich. ähnlich wie The 1975 verstehen auch sie es, überraschende, überwältigende Hymnen nach vollkommen eigenen Regeln zu stricken; ähnlich wie Chvrches wissen auch sie, wann man eiskalte Synthies einzusetzen hat, und obendrein gesegnet mit einem Indie-It-Girl wie der Sängerin Natti Shiner, hat die fünfköpfige Band aus Brighton auch noch die passende Frontfrau – das Debütalbum You Are Someone Else erscheint am 16. März. Viel ist passiert in den letzten zwei Jahren: 350 Konzerte gehen inzwischen auf ihr Konto, u.a. mehr als 100 Festival-Shows und ein ausverkaufter Abend im Kentish Town Forum; dazu verzeichnen ihre Songs über 40 Millionen Streams, und „Hello, Hello“, „Glue“, „Brooklyn“ und zuletzt „Hard To Be Myself“ gingen allesamt auf Rotation bei BBC Radio 1. Jedes dieser Stücke ist eine Hymne für sich, ein kleines Pop-Juwel: Geschrieben für die jüngste Vorglüher-Generation, mit Texten, die grandios zwischen hedonistischer Hemmungslosigkeit und schonungslos-knallharter Selbstanalyse oszillieren. All diese vorab veröffentlichten Songs sind natürlich auch auf ihrem kommenden Debütalbum You Are Someone Else versammelt, das am 16. März erscheint. Dazu gibt es brandneue Songs, die sie in den letzten Jahren komponiert haben, sowie ein paar Updates: unter anderem auch eine brandneue Version von ihrer allerersten Singleveröffentlichung „Swim“. Inhaltlich drehen sich die Songs, die Mike Crossey (The 1975, Wolf Alice, Foals) produziert und Mark Ralph (Years & Years, Clean Bandit) abgemischt hat, um Beziehungen und was sie mit jungen Menschen machen – es geht um grandiose Dates und grausame Begegnungen, ums Sich-Verlieben und natürlich auch um Trennungen und die dazugehörigen Wehwehchen. Der Eröffnungstrack „Wake Me Up“ umkreist obsessive ängste und Zu-viel-Nachdenken, während „Rotation“ von Beziehungs-Paranoia berichtet. Kombiniert ergeben diese Songs ein Debüt, das ein sehr gutes Bild davon zeichnet, mit was für Höhenflügen, was für Unsicherheiten, was für Emotionen man es zu tun hat, wenn man als Millennial im Jahr 2017/2018 lebt. Soziale Unbeholfenheit, Selbstzweifel, Angst und überhaupt: das ungute Gefühl, das dieses ganze Erwachsenwerden mit sich bringen kann – derartige Dinge präsentieren Fickle Friends auf vollkommen eigene Art, verschnürt als perfekte, ja: jetzt schon zeitlose Popsongs. ‘Hello Hello’ is the brand new single from Fickle Friends, which is available to hear now following its premiere last night on Radio 1 with Huw Stephens. ‘Hello Hello’ is the new offering from up and coming pop upstarts Fickle Friends. It follows their last single ‘Brooklyn’, released at the end of 2016, which became their first single to be added to the Radio1 playlist whilst also being heavily championed by the likes of Mistajam, Huw Stephens, and Alice Levine. In December, the band celebrated ‘Brooklyn’s release by headlining a sold out show at London’s Heaven at the culmination of their UK tour. Produced by Mike Crossey (The 1975, Wolf Alice) in LA, ‘Hello Hello’ is another perfectly crafted glittering pop gem that glides between intelligent indie and effortlessly doozy disco. On writing the track, Natti Shiner says – “Hello Hello was one of the first songs we wrote this time last year during our first trip to LA. The track came about in the home studio we'd put together in an Airbnb and it was one of those sessions where a song comes together super quickly, it just flowed. It's about sticking with someone who's lost sight of who they are and what they're worth. 2017 promises to be a very exciting year for Fickle Friends. To accompany the release of the new single, the band have recently been announced as the first headliners of the NME Student tour in March – see the full dates below. 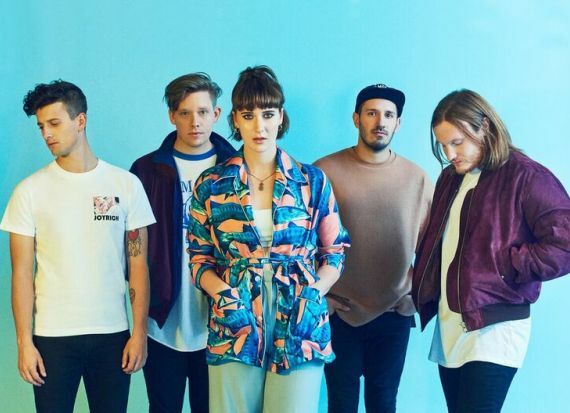 They head out on tour in May with PVRIS, supporting across their European and UK dates, as well as being confirmed to support Catfish and the Bottlemen at Community Festival in Finsbury Park in July. The band will also be revealing their biggest headline UK run in October – more details soon. Stay tuned for more music, further tour dates and festival slots. Fickle Friends release the brilliant and bold ‘Brooklyn’ ahead of their biggest ever headline gig at London’s Heaven on the 1st December. ‘Brooklyn’ is the next chapter in the Fickle Friends story. Following in the footsteps of ‘Swim’ and ‘Cry Baby’, the new single sees the Brighton 5 piece significantly raise the bar on their compulsively danceable brand of indie-pop with enough uplifting groove to carry us through the colder weather and darkening nights. 'Brooklyn’ is a smartly unforgettable song that drills itself into your brain with an undeniable chorus and whip-smart lyrics. Fickle Friends have spent the last year travelling the world, playing anywhere they can and recording their debut album. Already one of the most exciting new bands in the UK, considering they’ve accumulated over 9 million streams on Spotify alone, they’ve built their devoted fanbase in a doggedly old fashioned DIY way, winning over fans and critics alike not just with a stream of utterly memorable singles, but by staying on the road and consistently rocking every gig they play, leaving a stream of newly won over fans in their wake. As Fickle Friends’ stars continue to align, the band are preparing to embark on their final headline tour of the year which will kick off in Hull on the 18th November and ends at their biggest headline date at London’s Heaven on the 1st December.